They existed last year only You could vamp them (the Olives, not the collectors)? Hmmmmmmm.... I have a bunch of vampires that haven't had a chance to bite an egg lately.... I am seriously temptedto toss an olive at them. Meh. I would have loved to add to my frozen Olive army... Of course such a massive wall would happen when I'm egglocked AND out of freezes. I just bred the dragons of my Charming Lineage of Candelabra Dragons. There obviously weren't enough to create a wall, but I hope whoever gets them likes them! Wall looking good, I only need about 8 more eggs slots. I just bred some mints to the ap, and sent a few Zyus and a Golden Wyvern in too. Was able to breed at least 21 Xenos to the AP a few days ago. Hope people enjoy them! Hm. Is there a contest for collecting redfins ? WALL ! ... And the AP is still at almost 6 days... Well, I tried. Ok I'm tired of the olive walls...give us something else! lols at all these Olive walls. Glad I've never liked Olives and don't go to the AP anymore, haha! Thank you to @Shadowdrake for the wonderful Spotted Greenwing wall! I have eggs that I can't abandon so I was only able to pick up four, but I love them! edit: Some eggs hatched, I now have 7 Spotted Greenwing eggs on my scroll! I personally prefer the Greenwing wall over the Olive wall, except for the fact that I am always egglocked when the Greenwing wall happens, so I haven't been able to select any nice Greenwings yet. I was just thinking of this and came looking for a thread. I actually hate it. now there is nothing but storm dragons. Really? I do not understand why folks would breed them all at at once and release them. I try to do only a ffew of each breed at a time. It's currently filled with Bleeding Moons and I have a personal dilemma. 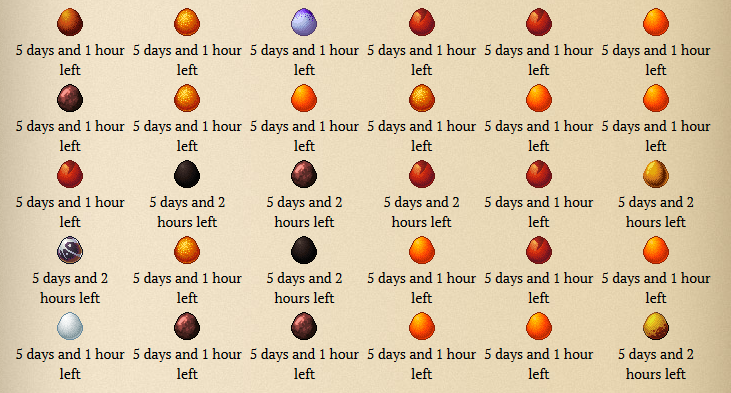 I have a bleeding moon frozen hatchie army that I'd love to add to, but the AP time is sort of high at the moment so I'd be taking up egg slots for 20 hours (even with incubate) and there are other breeds I actually need more of so... Hmm. Maybe I'll just grab one or two. The high AP time is my enemy and I'm going to send an army of Red-Finned Tidals to fight it. I want to do a hybrid wall so I can get dragons I'm missing, but I don't have many dragons who could actually breed for that. Welp, theres about 6-8 new Aeon eggs in the ap, plus a blue zyu. Although I'm not a fan of one breed taking over the entire AP, I'd love to see hybrid wall! Hey everyone, just a heads up, it's about that time of year again. AP is filled with nothing but Nocturne eggs right now and I'm having a hard time resisting. I have almost three-times my scroll goal for them, really really don't need anymore, but it's so hard to resist! Wall of magis and purples in the AP right now.